Start time for tournament is 13:00. I will open my door at 11:00. Please contact me if you need to come earlier. Until the summer and early september I was moving to a house. Now it is 4 weeks since I live here. My home is still in the Hamburg area (only 5 Minutes away from nearest tube station) not to far away from my old home. 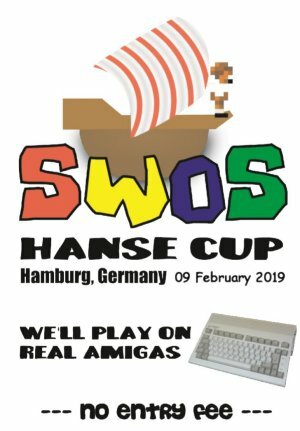 From what I have seen I can easily house 2 Amigas on my big desk and with the help of a second table it would be possible to place a 3rd SWOS machine here. That would mean 6 players could play at the same time. Beside of that it would be no problem to have 4 other players sitting around on my couch and 4 to 6 more people to sit on a chair/floor or stand in my rooms. That would mean a possible tournament size of 10 to 16 players that could stay for a tournament in my house. Besides of that I have a big garden where you can relaxx, play football, make barbecue and so on. If you wana sleep on the tournament location, pleae bring a air mattress and a sleeping back with you. Not sure yet. Could be sometime in the first half of 2019. Probably between February and May. But as it is my own home and I did not have to wait for a special date (as long as it fits my private dates) to have it here, I am free to have it anytime as long as I can prepare, let's say, at least 2 or 3 month before. Yes, you can... but others need to check their dates, too. So just write 2, 3 dates down here that are ok for you, to get some response! Otherwise it won't work. Anyway, cool effort. Sounds like a good place for SWOS! February or March would be thinkable for me, but first I like to check some interest by players. I would be interested to join if the date is right. Btw. don't pick the 2nd of march, as there is another edition of Danish Cup at that date. Im not sure if I will go, but some of the other danes might. Good to know and cool to hear that you are interessted. Then I probably make it at the mid of February or in May. I hope a few more players are interessted. Great! Hairfu, I'm interested, but I can't know about joining until december or so. I'd like to but I have to wait a bit to check several things to know if I will be able to attend. I will tell you. Good to hear. I am also interested. Just announce a date and I see if I can make it possible maybe combined with visiting relatives in HH. I would also be interested but can only do February or March. Another german player. Would be very nice to meat you in person (I guess would be the first time?). DATE WILL BE SATURDAY THE 9TH OF FEBRUARY 2019!